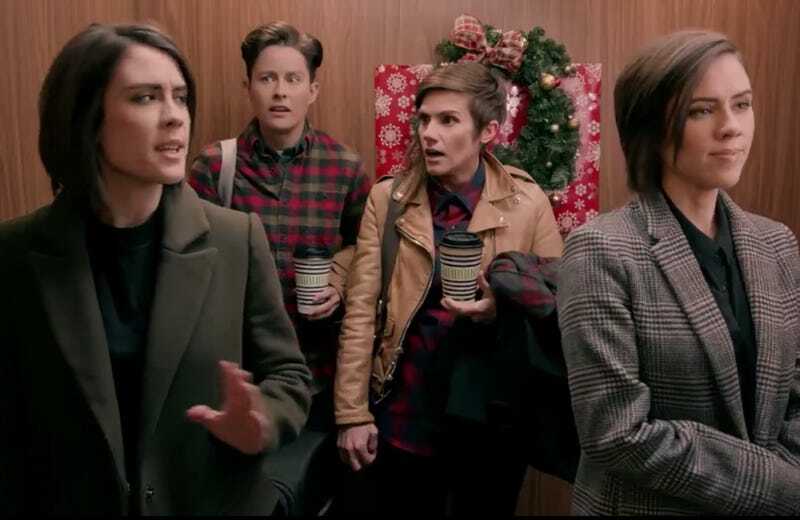 When NBCUniversal shut down Seeso last year, it left the fate of several series uncertain, including Cameron Esposito and Rhea Butcher’s winning series, Take My Wife. The married stand-ups play fictionalized versions of themselves in a comedy that blends the realistic parts of their lives—touring, travel, confronting stereotypes—with an occasional guest appearance from Tegan and Sara. The A.V. Club enjoyed the first season, so naturally we worried about the future of the show, but Esposito and Butcher have just announced that iTunes is the new digital home for Take My Wife. Eight all-new episodes are already available in the U.S. and U.K., along with the complete first season. Here are a few of the out LGBT actors joining the cast: Brittani Nichols, Jen Richards, Clea Duvall, Solomon Georgio, Gaby Dunn—oh, and Tegan and Sara. There’s also some good news for Starz subscribers: Seasons one and two will be available to stream as of May 1. Esposito contributes to the A.V. Club on occasion, as you might already know, and Butcher recently joined Phoebe Robinson and Jessica Williams on stage for the latest iteration of 2 Dope Queens.